Intertropical Convergence Zone (ITCZ) affecting Mindanao. 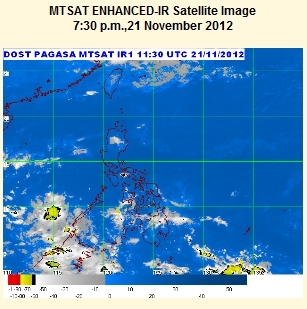 Northeast Monsoon affecting Northern Luzon. Palawan, Visayas and Mindanao will be cloudy with occasional light to moderate rains or thunderstorms. Cagayan Valley and the provinces of Aurora and Quezon will experience light rains. Metro Manila and the rest of Luzon will be partly cloudy with isolated brief rainshowers or thunderstorms mostly in the afternoon or evening.